Product information "HAIX Black Eagle Safety 40 Mid black/yellow"
Microfibre/textile combination. Inner Lining GORE-TEX® Extended; 3-layer GORE-TEX® laminate, waterproof and highly breathable. Abrasion-resistant lining with optimized climate comfort, especially for flexible alternating inside and outside use. Comfortable, cushioning, moisture repellent, anti-bacterial. Separate heel shape for good cushioning and foot insertion. “AIRFLOW” channels. „Perfect-Fit“ mark for an optimal verification of the correct shoe size. Very good grip on different terrains by profile configuration and use of a special rubber. Flexible, lightweight and metal-free sole with METAL FREE insert. 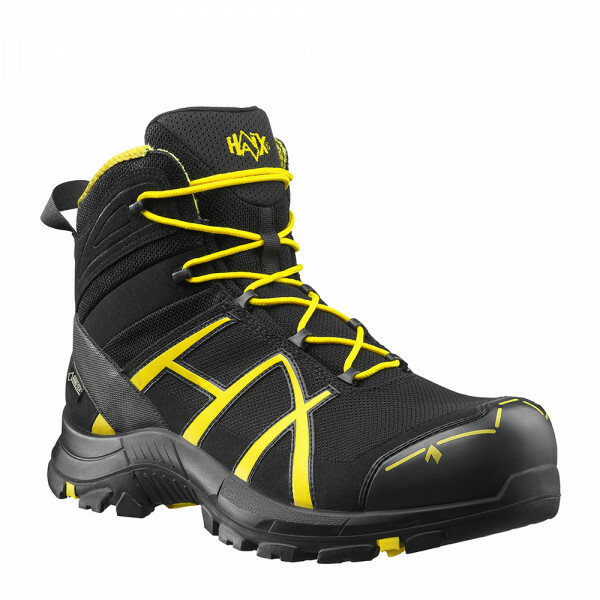 Modern, light weight and sporty sole construction with rubber/PU street/terrain tread, abrasion-proof, for enhanced toe-to-heel support, ideal for cold weather conditions. The lightweight PU cushioning wedge provides optimum wear comfort. Excellent thermal insulation. The nonmarking outer sole is resistant to heat, oil and gasoline. Electrostatically conductive footwear tested according to DIN EN 61340-4-3:2002. Anatomically formed and ultralight protective toe cap made of fiber-reinforced plastic for highest safety requirements. HAIX® Climate System with Micro-Dry lining along the upper edge of the shaft. Choose from 3 different inserts to adjust the boot to the width of your foot. Very comfortable boots. The loop on the heel is very large and wide to help putting them on. They tighten up nicely with a pull on the laces. You always have to be careful with fabric safety boots around hot work welding or grinding- but once you are aware of this - I find them more comfortable for warmer climates. I like these boots very much. I will have to see how long they will survive in the work environment- but the reputation of haix is excellent.